With Sharon in Sedona, I took off in the late morning for San Jose. The plan for the day with to caught up with Tomasin and David at the Silicon Valley Sevens International Rugby Tournament. Tomasin's nephew Stephen plays for the USA team. I got there in time to see the USA beat Tonga by the score of 29 to 7 (@12:50 pm). Stephen Tomasin scored four trys in the game! It was a long day with lots of international and collegiate games. 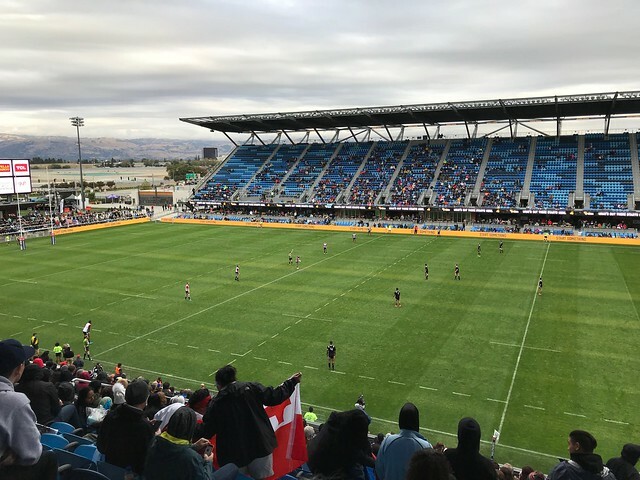 The USA beat New Zealand by the score of 24 to 12 (@4:28 pm) and then the USA beat Chile 29 to 7 (@8:00 pm) in the last day of the game. Stephen Tomasin scored another try in the game against Chile. There was a busload of Tomasins at the game, including John, David, John's sister Kathy, John's mom Pat, John's brother Jim, Jim's wife, Stephen's brother Nick and a couple of Jim's wife's kids. We ran into Brain Lowe and Paul Cutter. Tomasin and I played rugby with them on the UCD team almost forty years ago! Fighting the crowds leaving the Sharks game, we crashed at the Courtyard San Jose Airport.